Josh Gordon: "I've Always Been Able to Score Goals"
Following the news that he'd joined the Saddlers on a three-year deal, former Leicester City striker Josh Gordon has spoken to club journalists and welcomed the opportunity to make the move to Banks's Stadium. 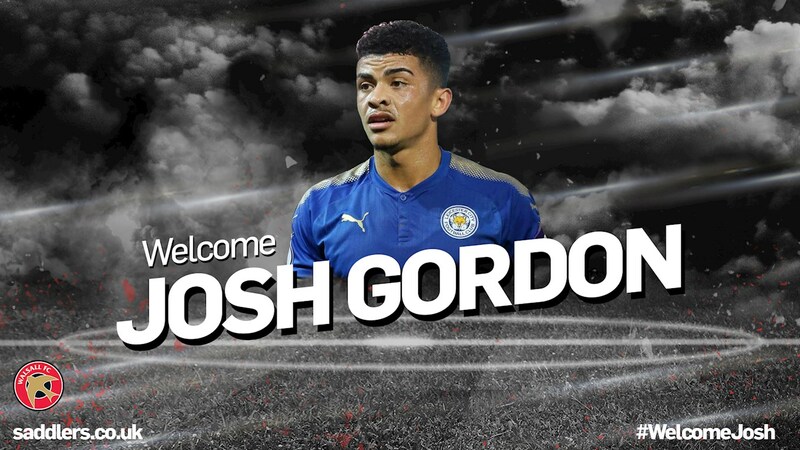 23-year-old Gordon, who joined Leicester from local non-league side Stafford Rangers in April 2017, made several appearances for the Foxes Under-23s side last season, but failed to make a breakthrough to the first-team and was delighted to receive the opportunity to join the Saddlers. Speaking via the club's official website - Saddlers.co.uk - Josh said; "I’m glad to be back in men’s football and hopefully I can prove myself in the league. Playing Under-23s football has helped me with the development side of the game but I need to play men’s football now. "I believe this club will help me progress and improve my game. I know the gaffer from Rhyl – I played with him there once and he’s got good expectations for the club. The way he was talking about how he wants the team to play and where he wants the club to go, it was music to my ears. "I’ve played men’s football since I was 16 so I can deal with the physicality. I’m strong, quick and I’ll work hard. I’ve always been able to score goals so hopefully I’ll do that here."